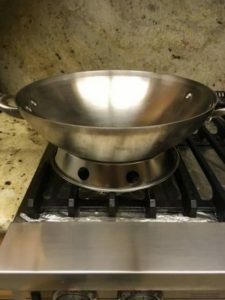 Blog Can I Use a Wok Ring on an Gas Range? I have had a few people contact me and ask if they could use a wok on a gas range. 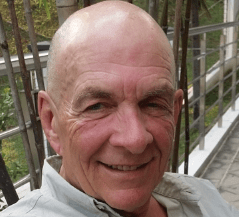 From my many years of using a wok, I knew the short answer would be “yes,” however, I wanted to give them a little more information rather than just a “yes” or “no.” I did some targeted research on wok rings so that potential purchasers could be better informed. First off, I want the reader to understand that stoves, in general, do not supply the amount of heat to a wok as Asian restaurants do. Several factors must be considered before using wok rings. What kind of stove can I use a wok ring on? What kind of stoves should I avoid using a wok rig on? Why is The Height of Wok Rings Important? What are The Alternatives to Using a Wok Ring? Wok rings do not work well on stovetops that are made of porcelain, ceramic or glass tops. Induction stoves would also fall into this “do not use” class of stoves. If you use any wok ring on a stove that is not a gas stove or an electric coil stove, you have to be very careful not to scratch those glass-like surfaces. Even if you were to use your wok and wok ring on these types of stoves, they might not get hot enough for cooking effectively. It is beneficial to have the flame of your stove reaching up and heating the bottom of your wok. These glass top-like stoves do not have flames, only heating elements. You could use a wok ring on an electric coil stove top if you were to use a round-bottomed wok. Understand that by using the wok ring with a round-bottomed wok will not produce the cooking results you desire. This combination does not get hot enough to stir-fry Asian style effectively. My first choice of stoves would be a gas stove, and then I would pick an electric coil stove as my second choice. 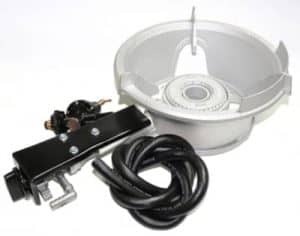 The best type of wok to use on an electric coil stove would be the flat-bottomed wok because the bottom of the wok would be in direct contact with the heating coils. 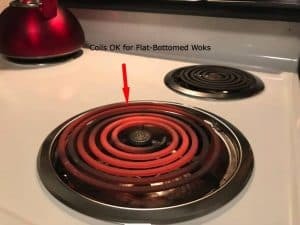 Using a wok ring on an electric coil stove with a round-bottomed wok would be marginal because there are no flames generated by those coils. If you use an electric coiled stove shown at the left, make sure you select a burner that will approximately fit the flat surface of the wok. If you use a flat-bottomed wok, you will not need a wok ring on this type of stove. What kind of stoves should I avoid using a wok ring on? There are several types of and these types depend on the design of your stove burners and applications. Not all wok rings are created equal! This 10-inch wok ring can be inverted to accommodate different sizes of woks. This wok ring has a rating of 3.3 out of 5.0 and can be found here at Amazon. This wok ring can only be used with the slotted tongs up as shown but it will accommodate round-bottomed woks between 12 and 20 inches. The base of this wok ring is 9.5-inches in diameter. I would like to see the round holes a bit larger for an increased flow of oxygen, but it may be ok. You can hardly go wrong with this wok ring, as it is priced reasonably at Amazon. It has a user rating of 4.3 out of 5.0 which is excellent. Information on this wok ring can be found here. wok stand made of high-quality stainless steel made to keep round bottom woks stable while cooking on your stove top, great for steadying the wok for serving. our gas wok ring is cold forged plated stainless steel. It has an innovative design, wok holder/ according to your pot size; both sides can be used, used to support woks when cooking on a regular range. This wok ring has a durable construction, sturdy chrome wire frame. You can place this wok ring on your table to support your round-bottomed wok. Currently, it has a rating of 4.0 out of 5 by its users. This wok ring can be found here at Amazon. For a greater selection of wok rings found at Amazon, click on this link. Here is just one example of wok rings offered by eBay. Exceptional Quality Reinforce aluminum wok rack with an open top and perforated sides. Avoid Wok Racks from China as they contain cancerous materials. This wok ring is made in Taiwan. This wok ring offers superior support for massive woks sizes 12-16 inches. Holds a wok steady on conventional cooktop stoves by placing over the burner. Check this wok ring out here. eBay also has a vast selection of wok rings and you can check them out here. There are many sizes of wok rings. Make sure that you purchase a wok ring that will fit the bottom of your round-bottomed wok. Each manufacturer will give you the dimensions of their wok ring and will suggest a specific size for your wok. On what cooking surface will you be using your wok ring on? Will you also want to use the wok ring to place on your table for direct serving out of your wok? 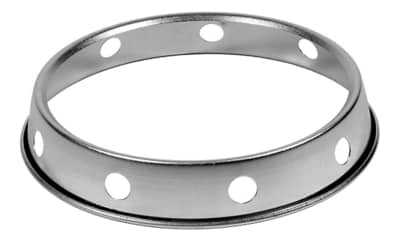 Amazon has many styles of wok rings. I suggest you take a look at their list of wok rings here. The height of a wok ring is important because it determines how far away from your burner you wok rests when in use. Most of the wok rings have a height of 1.5 to 2-inches. On a gas stove, you want to get your wok as close as possible to your flame as possible. If the height is too high, you will be limiting the amount of heat that can be applied to the bottom of the wok. It is usually not a big deal, but it is something that only takes seconds to check out before you purchase your wok ring. A wok ring is pretty easy to use. You merely place the wok ring on the top of your burner, then put your round-bottomed wok on the wok ring. Make sure that the placement of the wok ring on the stove is the correct size and shape for your burner. Also, make sure that your wok sits firmly in the wok ring. You would not want your wok to turn over in a wobbly wok ring and spill everything on the floor or you. Be careful when you are finished using your wok ring as it could be boiling. Clean it according to the instructions that might be included in the packaging. Stabilizes the wok and keeps it from wobbling around the burner. Use only with a round-bottomed wok. A wok ring concentrates the heat to a smaller area on the bottom of the wok and thereby heats the bottom of your wok to a higher temperature than just using the burner by itself. Remember that you want your wok to get as hot as possible. If you try to use a wok ring on your glass topped stove or induction burner, it can scratch the surface of both. 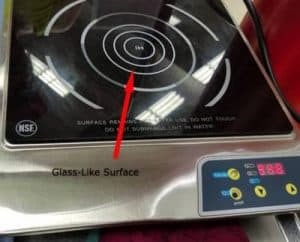 I have also heard that a wok ring can concentrate the heat to such a high degree, that it can damage the heating elements in both the induction stove and other glass-topped stoves. The heat that is reflected into the cooking surface from the wok when using a wok ring can severely damage your stove burning elements. Wok rings are not suggested to be used on either induction stoves or electric glass-topped stoves. If you did not want to use a wok ring, you could use a flat-bottomed wok on a gas stove. You could also use a flat-bottomed wok on an electric coil stove. Although scratching would not be of concern on this coil type electric stove, you might not be able to get your wok hot enough. It depends on your electric stove coil parameters. I would not use a wok burner on an induction stove or an electric glass-like topped stove. An excellent alternative would be to use a wok burner. Wok burners create a tremendous amount of heat and are made just for wok stir-frying. They should only be used outside and are fueled many times by propane. Here is an excellent example of an outstanding quality wok burner. It is easy to operate and will last you for years. There is no doubt that this wok burner will raise the temperature of your wok to your desired amount. This is a very powerful burner and can be found at Amazon here. There are many types and styles of wok burners to fit your needs. You can find a selection of wok burners here at Amazon. Here is another example of a wok burner. This 100,000 BTU is a tabletop wok burner that will more than fill you need for “heat.” This particular burner is offered at a reasonable price from eBay. Check them out here. Gets the job done FAST with a powerful 100,000 BTU/Hr burner. Extra Heavy-duty wall cast iron construction stands up to frequent movement from one location to the next. This wok burner is for outdoor use only. This stove comes with a fully adjustable regulator that connects just like a gas BBQ to refillable propane tanks. Round or flat bottom woks fit securely and safely into the sturdy cast iron supports. The stand is not necessary, just set it on the floor and hook it up to your existing propane tank. This stove is strong enough to fire the 30-inch woks India Joze Restaurant regularly used. Will burn a 20-gallon pot of water to boiling in about 10 minutes as opposed to almost an hour on a commercial range. Great for large-scale camping events. 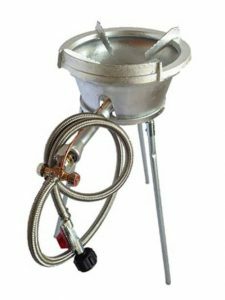 This burner includes 7 FT long gas hose and fully adjustable heavy duty regulator. What is a wok ring used for? The wok ring acts as a heat trap, which may damage the burner grate and burner head of electric stoves or induction stoves. It may cause the burner to work improperly. Another use would be to stabilize a round-bottomed wok on a gas stove or table. Why Would I Want a Cast Iron Wok Ring? Cast iron wok rings are made for specific gas stoves. Cast iron wok rings for stoves are usually manufacturer specific. Check with your stove manufacturer to see if they have a cast iron wok ring for your particular model of oven.